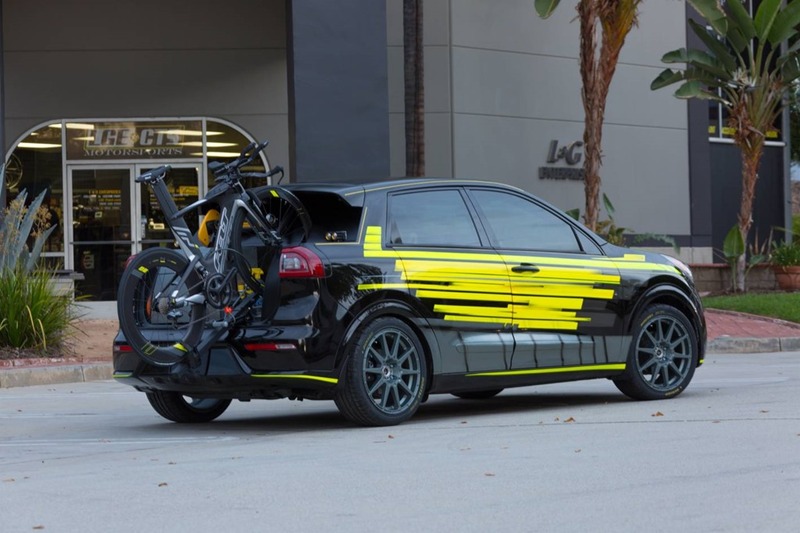 LAS VEGAS, November 1, 2016 – Kia Motors America (KMA) today unveiled four all-new customized vehicles at the opening day of the 2016 Specialty Equipment Market Association (SEMA) Show. Envisioning a future when vehicles will not only drive autonomously but be tailor-built to our lifestyles, each concept sparks the imagination of what could be just around the corner. Also making its SEMA debut is the Telluride full-size hybrid SUV concept that was first unveiled early this year at the North American International Auto Show. 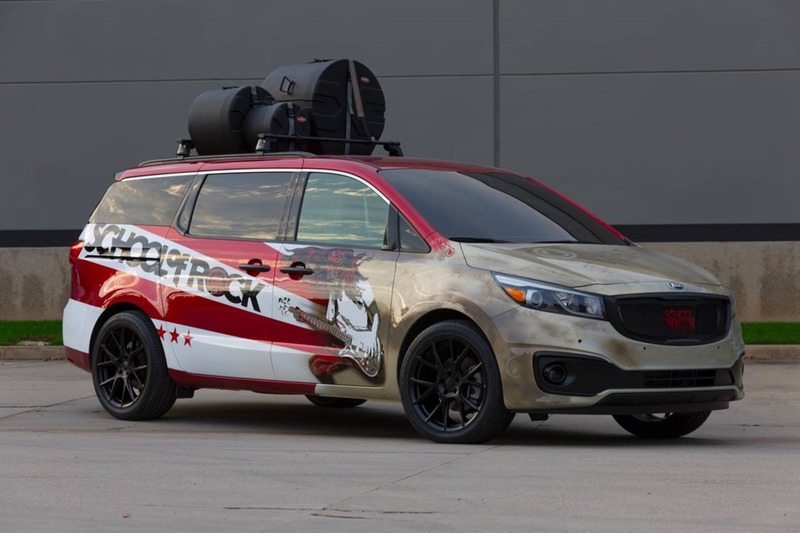 A total of five custom vehicles are showcased in Kia’s booth at SEMA, each eschewing what we normally ask of our day-to-day vehicular needs to blaze a thought-provoking trail of imagination and fun. Custom built by the master craftsmen at LGE-CTS Motorsports, the 2017 Niro hybrid has been transformed into a true crossover-utility lifestyle vehicle. Removal of the roof from the D-pillars back creates a small bed and allows for the custom bike rack, tool box and tablet computer mount. The Felt IA 2 road-racing bike can be easily removed or locked in place for repairs or transport. The ONEU safety laser bike lane light mounted to the rear illuminates a laser LED road behind the vehicle and the athlete can easily monitor speed, time and distance covered via the tablet while the Niro autonomously keeps pace. 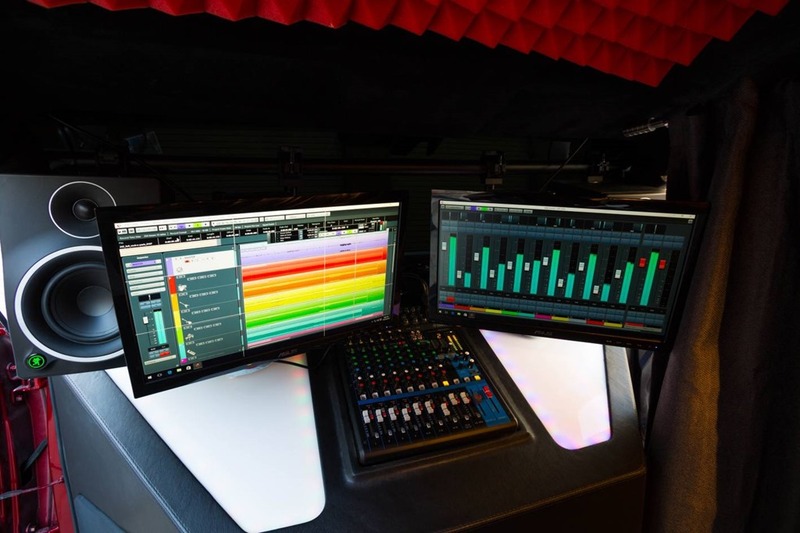 The tablet can also be attached inside the vehicle for entertainment or performance analysis while the Niro effortlessly drives the athlete home or to the next competition. Riding on a 2-inch lowered suspension, the Niro Triathlete is shod with 265/35R-18 Dunlop Direzza sport tyres and lightweight 18-inch Method Rally Race wheels. Layered on a base of candy red are contrasting white tan and black accents. The School of Rock logos and music-inspired icons are hand painted. While no modifications were made to the suspension, the School of Rock Sedona rides on flat-black painted 20-inch Vossen VFS-6 wheels that are wrapped in aggressive Toyo Proxes 255/45R-20 tyres. 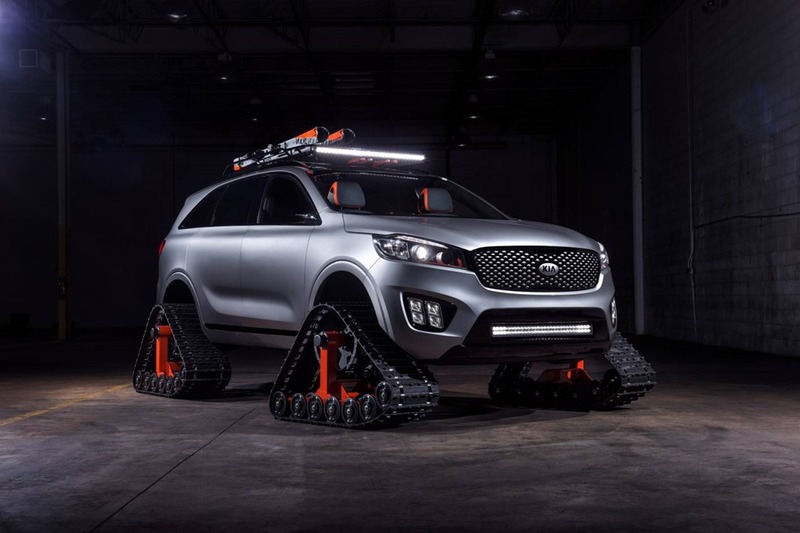 Taking the idea of a sport-utility vehicle to new heights – literally and figuratively – this custom Kia Sorento was built by LUX Motorwerks to tackle snow and ice as it gets you and your fellow skiers up to the top of the mountain for another run. The luxurious and self-driving Sorento Ski Gondola is all about climbing to higher ground in style, comfort and warmth. Dominator Rubber Tracks powdercoated orange make this gondola a go-anywhere cold-weather machine. A custom metal roof rack supplies ample storage for skis and poles while the cargo area provides abundant space for boots, bags and other gear, all easily accessible thanks to the removal of the B pillar and the rear doors being converted to suicide-style doors. Up front, the Sorento’s headlights were painted black, silver and orange and LED light bars were installed for increased visibility in all conditions. The Sorento Ski Gondola’s interior has been upgraded with custom door panels, dash and center console, which houses a personalized tablet. The interior has also been given a reboot of black and orange leather to compliment the orange and PPG Silver Metallic paint of the Sorento’s exterior. Throughout the interior the floor was given a durable waterproof Line-X treatment to protect against the ice and snow that may find its way inside. The Soul First Class is an upscale inter-city chariot that lets business travelers work and relax as they journey to out-of-town meetings and destinations. 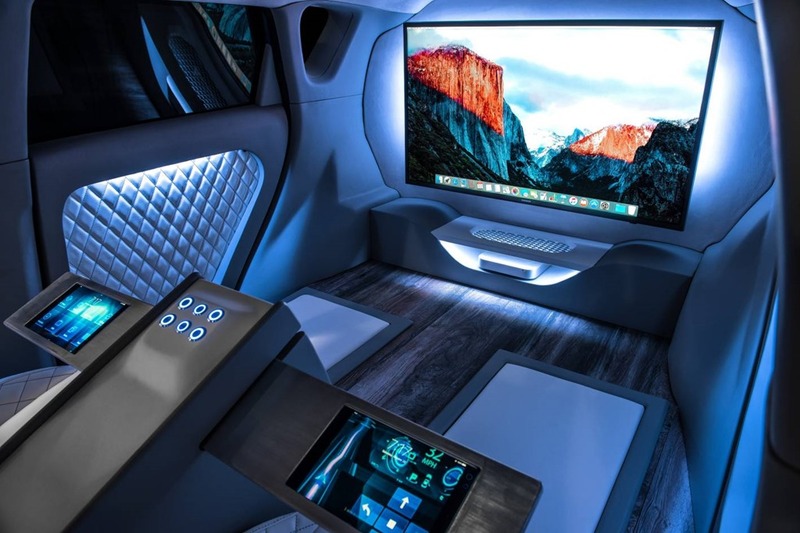 This self-driving custom-built creation from LUX Motorwerks – with its rear-facing seats, absence of steering wheel and wide array of luxury enhancements – is about optimizing work and rest amid the hectic schedule in one’s professional life. Eliminating the need for a driver, the Soul First Class has a revamped front dash which now houses two rear-facing front seats. The Soul’s passengers are then greeted by a 40-inch Samsung LED TV connected to a Mac mini computer system and premium audio speakers throughout. 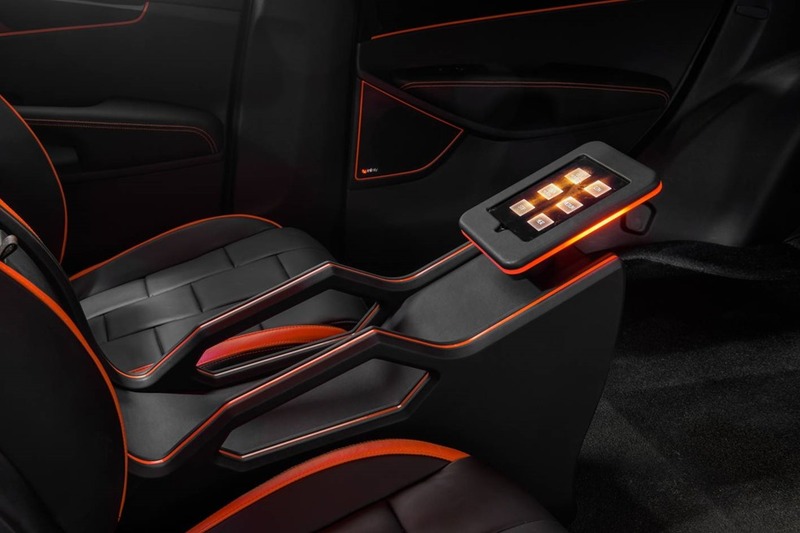 A custom motorized centre console reveals two tablets, which control this futuristic Kia. To match the first-class electronic system is first-class comfort with white and gray leather with diamond stitching throughout the cabin, and modern gray wood flooring to match. 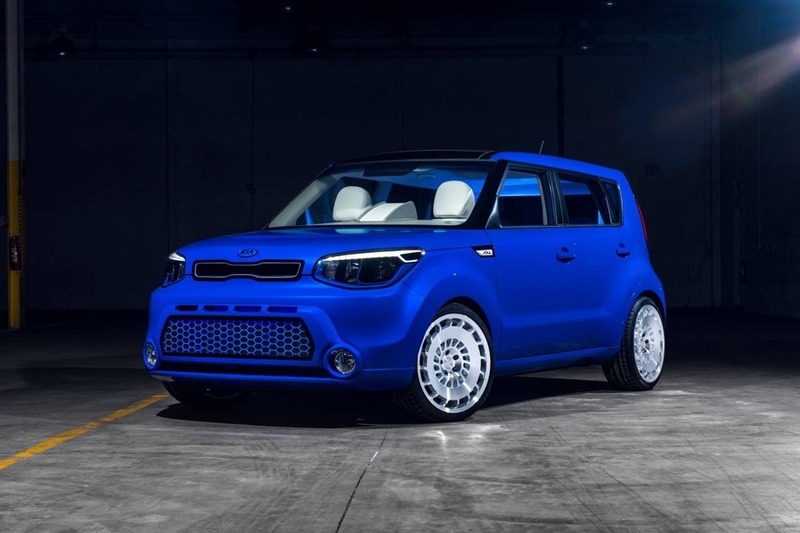 The Soul’s exterior brings about the same level of luxury as the interior with PPG Lux Blue paint and modified upper and lower grilles with LED lighting. The 19-inch Rotiform Monoblock CCV wheels bring a modern vibe to the car’s exterior and round out the complete autonomous vehicle inspired overhaul. Glimpsing a future that is grounded in reality but not bound by the present, the Telluride, a striking three-row, seven-passenger, luxury hybrid SUV concept features a modern and upright shape, muscular stance, and state-of-the-art technology to care for its occupants. Purely conceptual, the Kia Telluride is based on an existing platform and reveals the brand’s interest in potentially offering a premium SUV positioned above the current hot-selling Sorento. Telluride’s interior and exterior were penned at the brand’s California-based studio, Kia Design Center America (KDCA). Finished in Dark Pyrite green paint, the tall stance is amplified by the overall size of the vehicle. At 1801mm tall, 2009mm wide and 5001mm long, Telluride is 112mm taller, 119mm wider, and a sizable 241mm longer than the current Sorento. Underpinning the Telluride is a modified Sorento chassis with a wheelbase stretched 302mm to 3081mm, giving Telluride a dominating presence. It’s modern and muscular appearance is accentuated by flared fenders stretching around massive 22-inch five-spoke wheels wrapped in Hankook® Ventus ST 275/45R22 tires. Telluride’s front fascia incorporates a much larger version of Kia’s signature tiger-nose grille, and its menacing face brings an attitude all its own with recessed quad-LED headlamps, pronounced horizontal LED indicator lights, and an aggressive polished-metal skid plate below the bumper. In the rear, thin vertical taillights align with the modern design language of the SUV, while consistent styling cues across the front and rear door handles, hood scoops and dual exhaust tips enhance the vehicle’s solid appearance.